​Discomfort from teething, which may begin as early as 3 months, can wake a baby. The gums around the emerging teeth may be swollen and tender. Plastic and rubber toys are great for soothing aching gums. Note: Teething necklaces and bracelets are made of amber, wood, marble or silicone are choking and strangulation hazards; the Food and Drug Administration (FDA) warns against them. For help numbing and easing the ache and inflammation, try using damp washcloths that have been twisted and frozen (tie one end in a knot for better gnawing). Avoid teething rings that are frozen solid; they are too hard for children's mouths. A light, gentle rub or massage might give your little one a lot of relief. Remember to wash your hands, then massage the sore areas in your baby's mouth with your finger or knuckle. Pain relievers intended to be rubbed on a baby’s gums aren’t very helpful; a teething baby drools so much that the medication is quickly washed away. In addition, pediatricians warn that such medications can numb the back of the throat and interfere with your baby’s ability to swallow. If your baby is clearly uncomfortable, talk to your pediatrician about giving a dose of acetaminophen (Tylenol). Note: Numbing gels or creams that contain benzocaine are not recommended for infants. When your baby’s teeth are coming through, she may also have a very slight increase in temperature. But if her temperature reaches 100.4°F (38°C) or above, it’s not because of teething. If your baby has symptoms such as fever, vomiting, or diarrhea while teething, consult your pediatrician to find out whether she has a medical condition requiring treatment. 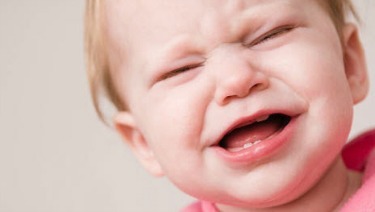 If your teething baby is irritable, try to make her comfortable, but keep to your usual bedtime routine. Changing the routine, even for a few nights, may only lead to sleep troubles.